Adorable Pudding Cup Halloween Treats! One of the biggest bummers about Halloween is that its a give-away-food based holiday that frowns on home made treats. I get it, I do. But I’d be lying if I said I didn’t wish I could make amazing (and adorable!) home made treats for the trick-or-treaters. 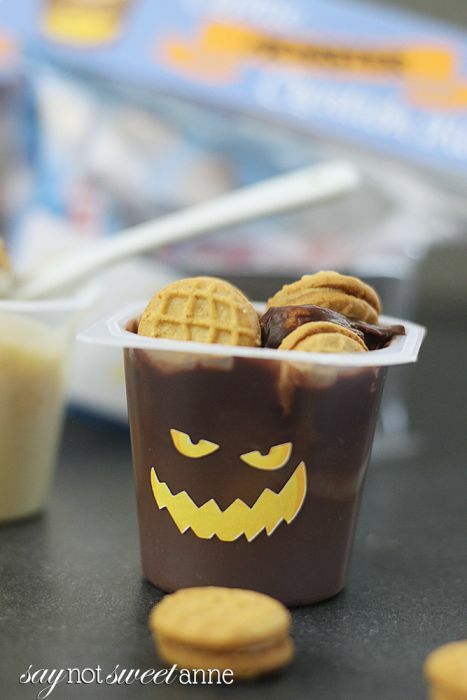 So when I was asked to make something Halloween Themed out of Snack Pack pudding packs… I knew exactly what I was going to do. A cute, fun, unique Halloween treat with NO home-made food items. But does that mean its “just” a pudding? Oh no. This pudding has personality. This pudding has a face. This pudding is a monster. A Cookie Monster to be precise. By pairing the Snack Packs with a single serve cookie pack and some adorable face stickers, this treat is better than just eating. Its got a great hands-on fun component in making faces on the cups and mixing in the cookies. I mean, c’mon. 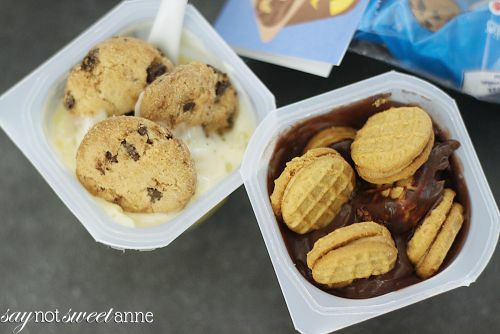 Pudding AND cookies? What’s there not to love? One of the other cool things about this treat is that Snack Packs come in a bunch of flavors (look at the Meijer aisle below! ), so you can make some awesome combinations in your kit! Mini Graham cracker bears with Lemon Snack Packs, Peanut butter cookies with Chocolate Snack Packs, Chocolate cookies with Vanilla Snack packs and more! I also love that while the Snack Packs are still a decadent/sweet treat, they have added calcium, and waaaaay less sugar than the typical Halloween candy. 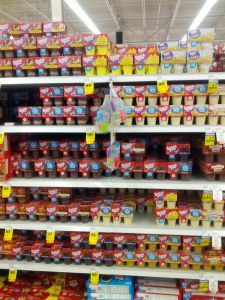 Snack Pack pudding packs, in whatever flavors you think sound good. Single Serving cookie packs. Graham cracks, animal cookies, variety packs etc. Bag to put it in. 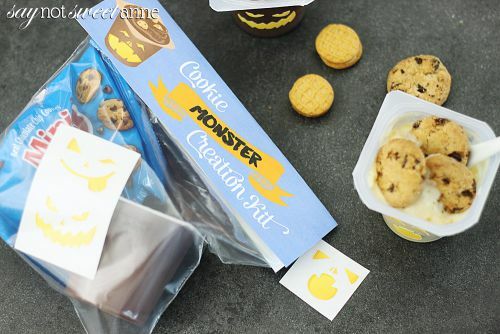 Add the Snack Pack, one cookie bag, a few of the stickers into your baggie. Cut out the label and fold it in half. Staple the label to the baggie top and voila! A safe to eat, never opened but still “homey” Halloween Treat! 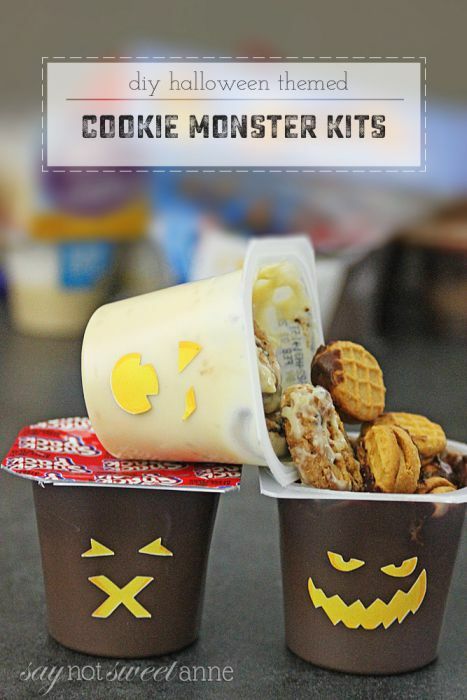 Check out what other bloggers have made with Snack Packs for Halloween and other holidays on the Snack Pack Pinterest Boards, or get even more ideas at the Meijer web site. 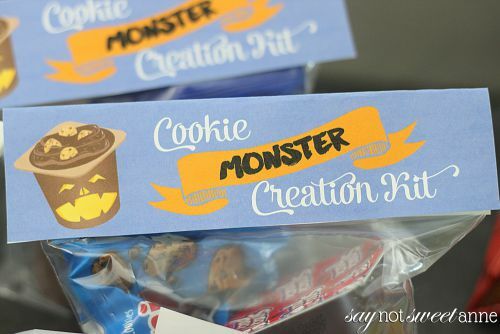 If you’re thinking of making the Cookie Monster Kits for Halloween, Meijer’s mPerks Rewards Program has a coupon running now through the end of the month! You can save $1 off of 4 Snack Packs, but you have to sign up for the rewards program/ be a member of the program to redeem. You can learn more about that here (Search for Snack Pack). Cristi Comes recently posted..Will You Dress Up for Halloween?